Investing strategically in new technologies will continue to be the centre of attention in the near future. In the “Age of the Customer”, organizations are under pressure to change the digital experience not only for their customers but also for their employees or other entities with whom they interact. For both business and IT leaders, it’s exciting to work with cutting-edge technology: Internet of Things (IOT), mobile, intelligent agents/bots, virtual reality, augmented reality, business intelligence. 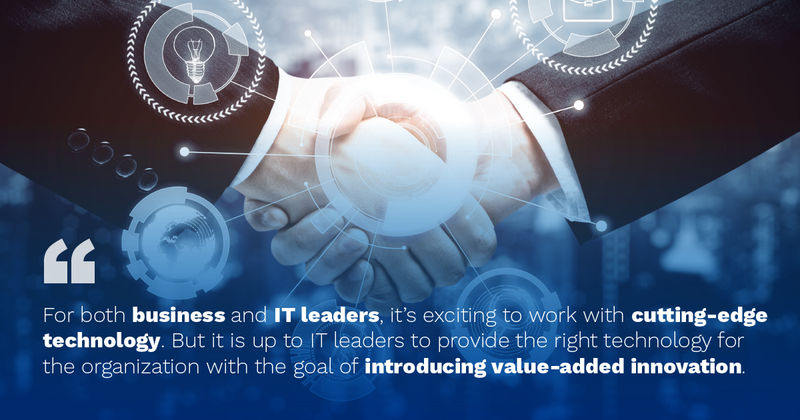 But it is up to IT leaders to know their marketplace (business, customers and competitors) to provide the right technology for the organization — not always the latest technology — with the goal of introducing value-added innovation. Business and technology working closely become fundamental to ensure a perfect alignment to allow the organization to lead in its market. Strategically, enterprises, through technology, should seek robust operations at a lower cost, delivering systems on a timely basis and with continuous improvement so it can simplify business by the intelligent use of technological innovation. When an organization understands that it can lead the market through customers’ digital experiences, digital operations, and the maximum efficiency of their systems, it can take full advantage of technology. The businesses that have most thrived using technology in the last decade are typically B2C businesses. Effectively, technology has greatly changed the way we deal with leisure, but it still has a long way to change also the way we work. With today’s digital audience increasing, the role of technology in corporate strategy must keep pace with its growth. To stay competitive, companies will need to leverage emerging social and mobile platforms to connect with customers to ensure that their brand, services or product strategies are aligned with consumer preferences. In order to compete in an increasingly fast and digital market, companies must equip themselves to become differentiators. First, by “speed”: speed to learn, to build, to deploy and to change. Secondly, by the ease and speed to which they can integrate with any other type of system. In addition, companies must also make a difference by providing engaging user experiences and empowerment to break down barriers and eliminate boundaries without ever forgetting security, which is a broad and evolving topic, as well as scalability, so that they can adapt to growth, avoiding disruptive implementations. Finally, following the evolutionary process, with the instrumentation and monitoring, to proactively deal with any issues that require adaptation. But, some companies will fall behind. First of all, all the companies that historically operated in environments where change was slow and threats were limited, unable to keep pace with markets and customers. Secondly, those companies whose decision-making process is far from those who are at the forefront and whose leaders responsible for creating policies and processes lack the practical knowledge. Finally, traditional organizations of the industrial age, focusing on efficiency, reduction and cost management, stability and reliability, qualities that remain important, but that does not, by itself, maintain competitive organizations in a digital environment. As such, five years from now we should see a market for new, transformed, digital organizations and businesses that adopt organizational strategies to drive speed, agility, and innovation. An exciting new world to come! Want to know more about how to align digital transformation projects with business strategy? Please check the ultimate eBook “Create a culture of digital business transformation” and articles about the latest industry trends.